I'm taking a break today! I've been working hard, need to rest and recharge ... so, in lieu of a philosophy post, here's the silliest picture I can find. 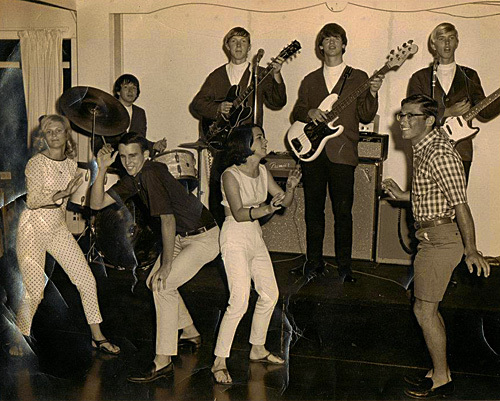 This photo was taken at a high school dance in Florida in 1965. A friend of a friend who I don't know posted it on Facebook. The photo itself is a work of art, but there's something else amazing about this picture: that band is the very young Allman Brothers (known, at the time, as Allman Joy). The unassuming guitar player on the left is the genius Duane "Sweetness" Allman, and I'm pretty sure that's Gregg Allman on the right. And ... that's all I've got for you today. Now I'm putting my shorts on and going dancing. This article is part of the series Philosophy Weekend. The next post in the series is Philosophy Weekend: Ayn Rand and the Paul Ryan Budget. The previous post in the series is Philosophy Weekend: Sam Harris on Morality. 1 Response to "Philosophy Weekend: Goofing Off"
where the acton is......good shot of those times Levi....I never saw this allman's shot before....i had the allman joys album, it came out after duane died....one song had him on electric sitar.